The End of Summer Sale and PAWS fundraising effort is currently in full swing and I have added some new and archived works into the mix! 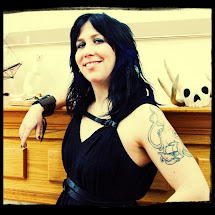 Please check out my shop http://www.etsy.com/shop/plushinator, share with friends, help me spread the word and help a homeless pet find a home (My darling fuzzy, Tanuki is a PAWS Alumni too)! 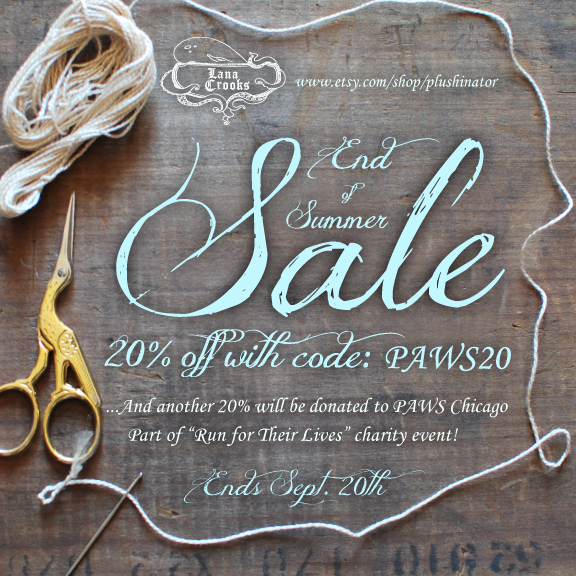 For all the sales made in my shop I will be donating to PAWS Chicago! You can get a sweet 20% discount off the work as well with coupon code PAWS20and I will donate 20% to the charity. If you prefer to not use the discount I will donate the full 40% in your name! And if you would like to donate directly and help with the fundraising please feel free here! The Sale is set to end Sept 20th when I will be turning in my funds! And, on September 23rd I will be running the Run for Their Lives 8k for PAWS Chicago (A no kill shelter for homeless cats and dogs)… I completed this race last year with a total donation amount of $1,125 (Thank you to all who donated and participated in my sale last year, it was amazing fuel for the race)! This year I have joined Team Paws as an alumni runner. I have been training and have had an uphill battle ahead of me as I am recovering from knee surgery. But I am determined (if not totally stubborn) and will finish the race…even if its dead last!